My Fav NYCC Promotions for 2013! Every year before NYCC, I get slammed with a ton of emails from different companies promoting their booth. Honestly, it is a disturbing amount. Still, it is always nice to see what people are going to be there or what free item they are giving away. This year, a few promotions really stood out as my must-have favorites. Yes, I know almost every comic company booth offers art cards as a freebie to get signed. Still, when they are limited to 100 and this pretty looking, I'm thinking yay! There are more than I have shown and you can check out the signing schedule for details. Yep, you read that right. They are giving away signed e-books. I have no idea how this is going to work but I am super curious. The books they are giving away are signed e-books by C. Robert Cargill, Alison Gaylin, Richard Kadrey, Adam Mansbach, Wendy Corsi Staub, and David Wellington. The event is Friday Oct. 11 at 6pm and is definitely one of the most unique events this year at NYCC. Ok, full confession: I didn't get an official email about this one but it is still one of the best things at NYCC so I'm adding it. 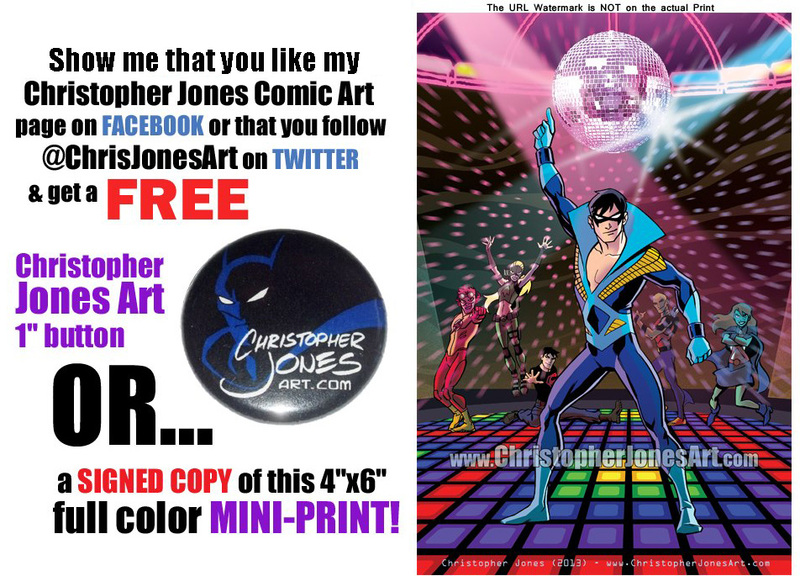 Christopher Jones is an awesome artist, who is currently on DC's Young Justice. Even if you aren't a fan, you have gotta appreciate the awesomeness of this print. All you need to do to get it is like him on FB, so the price is right too. Get there early to make sure you get one! If you think I've overlooked this amazing promotion that must be shared with the masses, tell me at insertgeekhere (AT) gmail (DOT) com. Also, make sure to check out our NYCC Party List so you know where all the best stuff is happening after the con floor closes! See you on the floor tomorrow!